UnaVoce is a women’s chamber ensemble directed by Mrs. Murray. It is co-curricular, meeting after school on Tuesdays and Thursdays from 2:35-3:30. 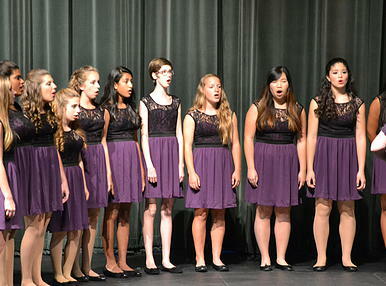 The number of participants varies between twelve and twenty; freshman and sophomore girls already enrolled in a curricular choir are eligible to audition. The ensemble will perform for WVHS concerts, out in the community, and participate in festivals and choir exchanges as the opportunities arise. UnaVoce will perform music from a variety of time periods and genres. Auditions for UnaVoce will be held within the first two weeks of school each year. 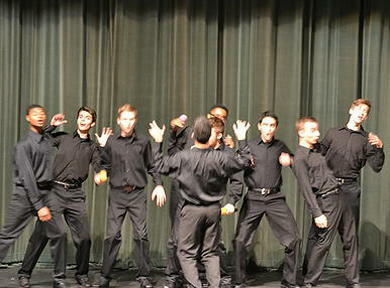 Formed in 2001, Cloud 9 is Waubonsie Valley High School's male a cappella, student led group. The group combines 9 talented male voices to perform innovative and entertaining arrangements of popular music. Cloud 9 holds a wide range of repertoire from Billy Joel classics to Gnarls Barkley's "Crazy" and from Boyz II Men to Coldplay's "Fix You". Performing at school events and various community events, Cloud 9 actively looks to encourage music in schools, and stresses the importance of music in every day life. At Chicagoland's AcappellaFest, Cloud 9 was awarded Grand Champion and Fan Favorite. Cloud 9 has recently performed at the Paramount and Six Flags Great America. a cappella group at Waubonsie Valley High School. The group was founded in 2002, and performs an eclectic repertoire; including pop, jazz and classical music. 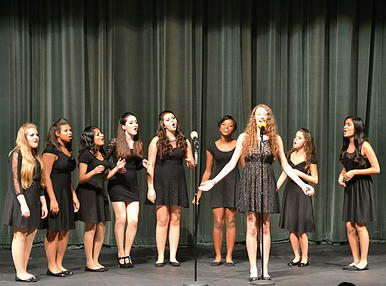 Pink Notes performs at curricular choir concerts, fundraisers, and holiday and community events. The nine member ensemble is entertaining, loves to have fun, and is committed and dedicated to the music they arrange and perform. Need to pay your fees? Or would you like to make a donation? Click on the button below to access our secure, encrypted pay site.